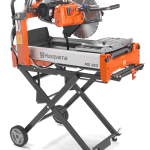 MS 360 is a masonry saw with a cutting depth of 5 inches. MS 360 is our first masonry saw equipped with our patented water management system. The water use is minimized by a unique distribution which keeps the work piece dry and the workplace clean. The optional adjustable stand enables one person to move MS 360 around the jobsite. The optional stand also makes it easy to position the saw in various heights or collaps it with one hand. With the quick and easy set up you will get more cutting done. 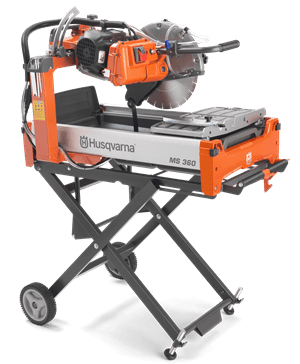 This masonry saw is ideal to use for pavers, bricks, stone and concrete block. Delivered with VARI-CUT™ Turbo blade.